How nerve cells flexibly adapt to acoustic signals: Depending on the input signal, neurons generate action potentials either near or far away from the cell body. This flexibility improves our ability to localize sound sources. In order to process acoustic information with high temporal fidelity, nerve cells may flexibly adapt their mode of operation according to the situation. At low input frequencies, they generate most outgoing action potentials close to the cell body. Following inhibitory or high frequency excitatory signals, the cells produce many action potentials more distantly. This way, they are highly sensitive to the different types of input signals. These findings have been obtained by a research team headed by Professor Christian Leibold, Professor Benedikt Grothe, and Dr. Felix Felmy from the LMU Munich and the Bernstein Center and the Bernstein Focus Neurotechnology in Munich, who used computer models in their study. The researchers report their results in the latest issue of The Journal of Neuroscience. Did the bang come from ahead or from the right? In order to localize sound sources, nerve cells in the brain stem evaluate the different arrival times of acoustic signals at the two ears. Being able to detect temporal discrepancies of up to 10 millionths of a second, the neurons have to become excited very quickly. In this process, they change the electrical voltage that prevails on their cell membrane. If a certain threshold is exceeded, the neurons generate a strong electrical signal — a so-called action potential — which can be transmitted efficiently over long axon distances without weakening. In order to reach the threshold, the input signals are summed up. This is achieved easier, the slower the nerve cells alter their electrical membrane potential. These requirements — rapid voltage changes for a high temporal resolution of the input signals, and slow voltage changes for an optimal signal integration that is necessary for the generation of an action potential — represent a paradoxical challenge for the nerve cell. “This problem is solved by nature by spatially separating the two processes. 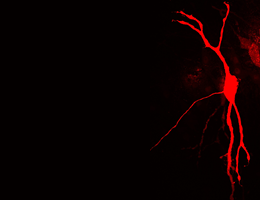 While input signals are processed in the cell body and the dendrites, action potentials are generated in the axon, a cell process,” says Leibold, leader of the study. But how sustainable is the spatial separation?